They talked about it for hours, with an contagious ethusiasm about the quality and freshness of the products that were going to found in the shop, about an “auntie” who was going to knead and bake pies and homemade bread and about their vision of how the place should look like. Therefore, in the process of design, we settled the priorities regarding the exhibit of the products, an efficient traffic flow, and not last, the facus point of the space: the exposure of the meat products with vizibility straight from the entrance of the shop. For a better vizibility of the bread products we proposed raising this area by building two steps, solution that delimitates in the same time the area of bread products form the rest of the space. 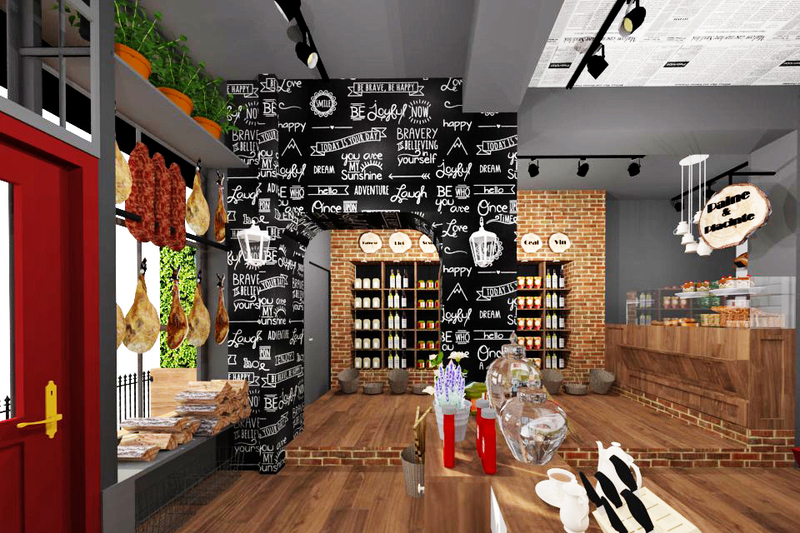 We let ourselves be inspired by the name of the shop and, therefore, through the design, one can feel the familiar atmosphere created for the people living in Buzau of the Crang park. Regarding the facade of the shop, to create unitary design, we kept the concept of the park as a fundamental idea, in both interior and exterior creating funny sketches.